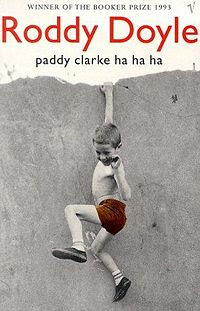 Let me just say that I LOVE Roddy Doyle's writing. I have always been a big fan of his, and my favorite book of his happens to be "The Van". Somehow this book had escaped me. Set in a small Irish village in the 1960's, it is narrated by Paddy or Patrick Clarke. Written exactly how a 10 year old thinks, and would write his thoughts, the mood and writing style took you right into his mind. It gave you a clear mental picture of what a child's world is really like. Tales of playing in construction sites, lying to their parents, and sibling rivalry as only a child could say it. Funny and sometimes sad, it is about how he grows up, rather quickly, as his parent's fight and eventually divorce. There were no chapters which made it harder to read, for me anyway, because I tend to pace my reading by the ubiquitous "just one more chapter"! But after 20 pages or so, this was not missed at all! It did have quite a few Irish expressions which were funny and some of them I had completely forgotten about and made me laugh out loud. It did take me a bit to get through, but I did enjoy it. Y'know, I've never read anything by Doyle, but I absolutely loved the movie The Commitments and enjoyed The Snapper as well. Hi Lesley! Try to find a copy of the movie "The Van". It completes the trilogy!!! Or you might have to read it, I think the movie is out of print!